Join us and start planning your perfect Universal Orlando Trip. Planning a trip to Universal Orlando -- home to the amazing Wizarding World of Harry Potter: Diagon Alley and Hogsmeade -- can be a daunting task. We'll make your trip planning as easy as possible with our step by step guides and easy to use tools. 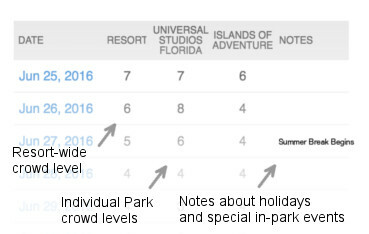 Use our Crowd Calendar to see the best times to visit Universal Orlando. You can use our Crowd Calendar to plan around kid's school schedules, holidays, and special events that happen at Universal Orlando. Our Crowd Calendar shows you the exact crowd levels for each park on every day of the year. In the example above you can see which days to avoid one park and visit the other less busy park. Next, read our Universal Orlando Touring introduction for a primer on the resort, and our Touring Basics page to learn how much time to allocate for your trip, and how to integrate a Universal visit with a Walt Disney World vacation. Before finalizing your plans, check out our Universal Orlando Refurbishments schedule to see if any rides will be closed, and visit our Universal Orlando Special Events calendar to learn about seasonal celebrations like Halloween Horror Nights, Mardi Gras, Christmas, and A Celebration of Harry Potter. There are a variety of Loews-operated hotels on Universal Orlando property with a range of themes and prices, from the luxurious Portofino Bay Hotel to the value-priced Cabana Bay Beach Resort. First, take a look at our Universal Orlando Resort Hotel Basics page for an introduction to the resorts' amenities and policies. Then check out our Universal Orlando Resort On-Site Hotel Benefits page, where we cover exclusive perks like Early Park Admission to the Wizarding World of Harry Potter, free Universal Express passes for skipping the standby lines, and more. We also have in-depth overviews on every Universal Orlando Resort hotel, and advice why you should (or shouldn't) book a Universal Vacation Package. Finally, read our Transportation page for tips on getting to and around Universal Orlando, whether you are coming from the airport or Walt Disney World. Universal has several admission options to choose from and finding the cheapest combination can take hours. You can save money with our Universal Orlando Tickets page. We’ll explain all your admission options, including Park-to-Park upgrades and Annual Passes, and show you where to find the best deals. If you're on a budget, our Universal Orlando Discounts page lists dozens of ways to save on hotels, food, merchandise, and more. 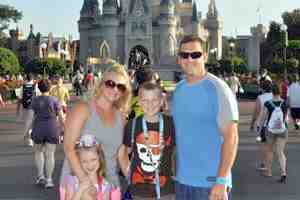 MouseSavers also has a useful page showing Universal Orlando discounts. When you're in the parks, you need a game plan for each day. Our Touring Plans are step-by-step guides that save you up to 4 hours of standing in line every day. We've got field-tested templates to start with, for Universal Studios Florida and Islands of Adventure. Customize any plan by adding attractions, meals, and breaks. Don't know what to ride? Start with our overviews of Universal Studios Florida and Islands of Adventure to get the lay of the land. Once you're oriented, we have detailed reviews of every ride, show and attraction in Universal Studios Florida and Islands of Adventure, including the best times to visit each attraction, showtimes for all performances, the ride’s potential for frightening small children, height requirements, handicap accessibility features for guests with special needs, and comprehensive critical ratings. Many reviews include comments from other families, so you can get a wide range of opinions on every experience. To save you even more time at Universal's parks, we also have comprehensive coverage of the daily opening Rope Drop (for getting the jump on the crowds if you aren't eligible for Early Park Admission), Single Rider Lines (for those who don't mind flying solo), and Universal’s front-of-the-line Universal Express Pass (for bypassing the regular lines altogether, albeit for a price). Finally, if you have much more money than time, Universal's VIP Tours can make anyone with enough cash feel like an A-List celebrity. Food is a big part of everyone's vacations and with so many choices it can make your head spin. We have up-to-date menus, prices, and reviews from every restaurant, food cart, kiosk, bar, and snack stand in Universal Studios Florida and Islands of Adventure, as well as the CityWalk entertainment complex and Universal's on-site hotels. Included in this is a handy search feature lets you find the food you’re craving. We'll even help you decide if the Universal Dining Plan is right for you. Once you're inside the parks, you may be interested in info on various services and solutions to common problems at Universal Orlando, including lockers, shopping locations, money matters, and the Photo Connect souvenir picture service. You can even see your touring plans on your phone! Our mobile app Lines is available on iTunes and Google Play. Lines shows you Universal’s official wait time plus how long you’ll really wait in line at each attraction. Use Lines to get instant updates to your touring plan, search menus, see parade times, chat with Universal experts, and more. For iPhone, Android, and other smartphones. Finally, once you've returned home from your trip, please complete our Universal Orlando Survey to help improve our ride and restaurant ratings for fellow visitors! We’re sure that you’ll save time and money and have a better Universal vacation with TouringPlans.com. And if not, we offer a 45-day full refund. Just submit a request on our Help site if you’re not completely satisfied. Want to see more? Explore our Universal Orlando content through the links below:on the right side.